Razzaque, M.A. Global trade slowdown and SDGs. 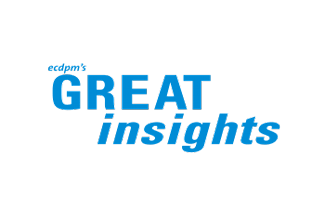 GREAT Insights Magazine, Volume 5, Issue 6. December 2016/January 2017. 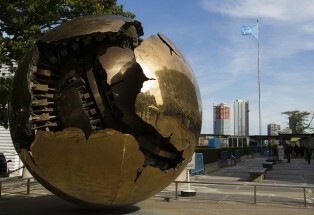 Unlike its predecessor, the 2030 Agenda for Sustainable Development provides an elaborate role – both direct as well as cross-cutting – for international trade in achieving many specific goals (SDGs) and targets. The Millennium Development Goals (MDGs) explicitly mentioned trade only under MDG 8 relating to global partnerships, while in the SDGs trade appears directly under seven goals concerning hunger, health and wellbeing, employment, infrastructure, inequality, conservative use of oceans, and strengthening partnerships. All-in-all, the word ‘trade’ has been used 19 times in the text of the SDG document that was adopted by the global community. Compared to MDGs, the SDGs go further in clearly identifying the tools, or ‘means of implementation’, for meeting its targets. It is in this respect that trade has been given a prominent role. This heartening effort of mainstreaming trade in a global development strategy has, however, come at a rather inauspicious time. More than eight years after the global financial crisis of 2008, the world economy is still struggling to return to its pre-crisis growth trajectory. This is accompanied by a severe trade slowdown that has been unprecedented in nature. The weak economic performance of the euro-zone, further exacerbated by the likely fall-outs of Brexit, growth slowdown in some major emerging economies including Brazil and China, slump in commodity prices affecting export performance of a large number of poor and vulnerable countries, heightened protectionist measures in the aftermath of the global financial crisis, and the failure to conclude the long-running Doha Round of multilateral trade negotiations – all of these have contributed to the very weak on-going trade expansion. In the backdrop of a prominent role assigned to trade in the SDG framework, the current outlook for trade-led economic growth and development appears to be uninspiring and achieving its full potential is likely to be very challenging for many developing countries. In 2016, world trade is expected to expand by 1.7% — lower than the corresponding growth of the previous year, 2.4%, and representing the slowest pace of yearly growth since the global financial crisis (Figure 1). 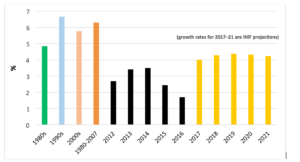 Indeed, since 2012, for every individual year, global trade has grown at a much slower pace than that of the average growth of about 6.5% achieved over the almost three decades (1980–2007) immediately prior to the financial crisis of 2008. Such a prolonged period of weaker world commercial activities is unprecedented. If International Monetary Fund (IMF) projections are correct, 2012–21 could be the slowest decade of trade expansion since World War II. 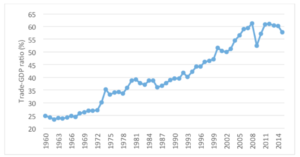 The long-run trend in trade-to-output ratio in the global economy had seen a rapid rise from less than 25% in the early 1960s to over 60% in 2008. This was the time when the growth in trade on average was twice the growth of GDP. However, since the global financial crisis, for most individual year trade growth has barely matched or even fallen short of the expansion in overall economic activities as reflected in Figure 2. While one can argue whether such changes in trade-orientation should necessarily be a cause for concern for the global economy, it is important to consider what it implies for the participation of poor and vulnerable countries in world trade. Note: Global trade volume of goods and services. Source: Data are from IMF and WTO. Source: Data are from World Bank World Development Indicators. Recent IMF analysis suggests that overall weakness in economic activity (in both developed and emerging countries such as China), including investments, accounts for nearly three-fourths of the trade slowdown. The rest can be attributed to structural factors, which include, among others, China’s rebalancing of economic activity away from investment towards consumption and services, with a depressing impact on trade; consolidation of value chain activities in production and trade, leading to domestic inputs being substituted for imported inputs etc. Trade expansion in the 1990s was also triggered by trade liberalisation which has not achieved any further breakthroughs in recent times largely because of stalled multilateral trade negotiations. 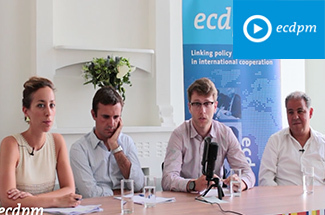 The drive for unilateral trade liberalisation has also been weak. Securing enhanced participation of the poorest and most vulnerable countries in world trade, especially least-developed countries (LDCs), has been a longstanding international development objective. While there was some encouraging progress during the 2000s, consequences in the aftermath of the 2008 financial crisis seem to have reversed the trend. 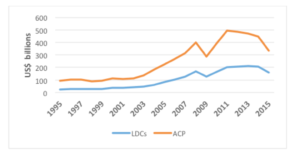 During 2000–2008, LDC exports grew nearly five-fold, from US$43 billion to about US$200 billion, the exports from African, Caribbean and Pacific (ACP) countries rose more than three times, from US$146 billion to US$478.5 billion. However, in 2015, LDC exports stood at only US$201 billion – just about the same as in 2008. On the other hand, ACP exports in 2015 – US$434 billion – were actually more than $50 billion smaller than they were in 2008. An overwhelming majority of these countries have failed to diversity their export structure, continuing to rely on primary commodities including fuels and other minerals, prices of which collapsed in the aftermath of the financial crisis, causing their export revenues to suffer. As a result, the secular decline in the share of these countries since the 1950s was arrested only for a short period, between 2006 and 2010, when their shares started declining again. Source: Data are from UNCTADstat. Source: Author’s calculations from UNCTADstat data. Indeed, it seems that faltering LDC participation in global trade is to deal an early blow to one SDG target as stated under SDG 17.11. Having adapted from the other UN-led initiative—the Istanbul Programme of Action (IPOA) for LDCs for the Decade 2011–2020—this target stipulates a doubling of the LDC share of global exports by 2020. At the start of IPOA implementation, the corresponding LDC share was 1.05%; this declined to 0.96% in 2015. Estimates presented in a Commonwealth Secretariat analysis shows that achieving the target of raising this share to 2.1% will require LDCs to post an average annual export growth rate of more than 25% during 2016–2020. This appears to be an almost impossible task given current trends in global trade. The global financial crisis has also fuelled a rise in protectionism, with different countries implementing various trade-restrictive measures. The WTO estimates that a total of 1,583 trade-restrictive measures have been imposed by G20 countries since 2009, and only a quarter of these measures have been removed. 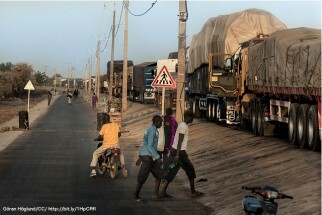 These restrictions have had a detrimental impact on trade flows, particularly for the world’s poorest countries. According to an estimate by Evenett and Fritz (2015), LDCs have incurred a loss of US$264 billion in exports as a result of these protectionist measures. In other words, the value of LDC exports could have been 31% higher if post-crisis protectionism had been avoided. It follows from the above that, as countries start implementing SDG-related actions, they confront a challenging external environment. The sluggishness in trade points to a situation where its traditional role to generate growth and development—for which there is broad-based consensus—is not being utilised. There are well-documented benefits of trade, including efficiency gains that help lower the costs of production and the prices of goods, productivity gains through the spread of knowledge and technology and realising the benefits of economies of scale and scope by allowing specialisation in the goods and services in which countries have a comparative advantage. Reviving global trade flows is an important issue to keep the SDG implementation process on track. At the same time, the need to revitalise global trade flows and the multilateral trading system cannot be overemphasised. Following the WTO’s Nairobi Ministerial Conference, and not least because of the Doha Round running for more than 15 years, identifying concrete solutions to the current stalemate is one of the most pressing challenges for multilateral cooperation. As a first step, effective implementation of the WTO’s Trade Facilitation Agreement (TFA) can contribute to enhanced trade flows by reducing costs and renewing commitment to trade multilateralism. Given that tariffs have come down quite significantly, most trade and welfare gains are to be associated with tackling non-tariff barriers and improving trade facilitation measures. According to the World Trade Report 2015, implementation of the TFA has the potential to increase global merchandise exports by up to US$1 trillion per annum, which can certainly help bolster the role of trade as an effective means of achieving the SDGs. It cannot be overstressed that, without a vibrant multilateral trading system, it will be very difficult to promote and protect the trade and development interests of vulnerable countries. This is particularly so when a number of trade-related development goals in the SDGs are linked to Doha Round-related issues. In this connection, it is imperative to immediately remove all the trade restrictions against poor and vulnerable countries that were imposed following the global financial crisis. Along with this, there should be enhanced trade capacity-building support to ensure the participation of vulnerable countries in the multilateral trading system. Needless to mention, it is the lack of productive capacity that is the most important constraint facing many poor and vulnerable countries. To put things in perspective, 48 LDCs with a total population of 837 million, have combined merchandise exports of about US$210 billion (estimated for 2014), which is lower than what Malaysia, a country of 27.8 million people, exports. 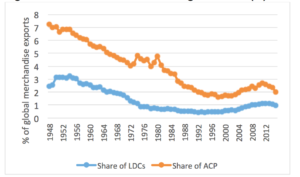 With a share of close to 12% of global population, LDCs’ contribution to global GDP stands at just above 1%. In order to achieve enhanced and transformative productive capacity, these countries will require reinvigorated and sustained support from the international community. According to the World Investment Report 2014 of UNCTAD, at current levels of investment in the relevant sectors, developing countries face an annual gap of US$2.5 trillion per year in meeting the SDGs by 2030. The SDGs are an important opportunity to address their developmental problems including their enhanced participation in global trade. Razzaque, M., B. Vickers and P. Goel. 2016. “Global Trade Slowdown, Brexit and SDGs: Issues and Way Forward”, Commonwealth Trade Hot Topics, issue 132, Commonwealth Secretariat: London. Evenett, S.J. and J. Fritz. 2015. 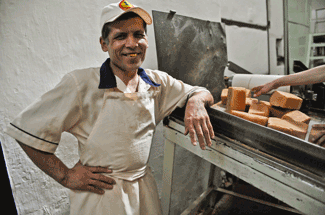 “Throwing Sand in the Wheels: How Protectionism Slowed Export-Led Growth for the World’s Poorest Countries”, Report prepared for the Government of Sweden (revised version). 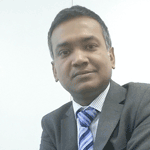 Dr Mohammad A. Razzaque is Head of International Trade Policy at Commonwealth Secretariat, London, United Kingdom. Any views expressed and/or limitations are those of the authors and should not be attributed to the Secretariat. Photo:Empty cargo containers, France. Credits: Tristan Taussac, via Flickr.com.